Robin and Wade have been interested in co-housing for some time, especially as a nice way to wind down and enjoy community with others after having very busy careers. Robin has been a social worker in private practice for 35 years with specialties in trauma and neurofeedback. Wade has been a college faculty member and administrator. Robin currently works in her office space downtown which she co-owns and shares with other complementary medical practitioners. Wade and Robin share interests in yoga, organic gardening, and hiking. Robin's interests also include her horses and a variety of crafts. Wade is currently involved in research and writing and has interests in community development, architectural design and sustainability. Over the next decade, Robin and Wade hope to spend more time enjoying one another, three grown children, two grandchildren, and two horses. Robin and Wade both look forward to being part of the Emerson Commons Community. James is a music producer, focusing on collegiate a cappella singing. He started recording and mixing in his last years at UVA, asking his friends' groups to pay if they liked his work, and he's still at it 13 years later. James loves to have people over to play card games or watch sports, especially if they're rooting for the Wahoos. He also plays the keyboard in a local band or two. Rebecca spends her days raising Connor (3), helping run his co-op preschool, and occasionally doing some marketing work for a local tech company. Rebecca enjoys experimental cooking, yoga, reading, sleeping in (ha!) and watching a great tv show. Connor is really into digging in dirt, acting out convoluted stories with his vehicles, reading, and running in circles with friends. ​James and Rebecca both knew they wanted a stronger sense of community, but until finding out about cohousing, they didn't know how that might be possible. They are looking forward to a more connected social life, and are excited for their son to grow up in a community where it's possible to have friends of all ages. Cathey has spent the last 43 years in education. As a Montessori directress at the outset, she moved into elementary education in Orange County, Florida. Then joined the math faculty at Valencia Community College in Orlando after receiving her Master's in 1985. She is currently a visiting professor for the online division of Everest University, based in Lakeland, Florida. She is the mother of two beautiful daughters Amanda and Jennifer, and mother-in-law to loving Jeff, who all reside in Richmond. Her heart work is sharing the principles of conscious parenting (and grandparenting), which are described beautifully at The Child Project. 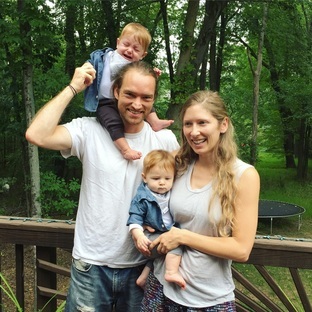 Amelia and Nick moved to Virginia in 2014 after escaping the suburban sprawl of Chicago. Nick is a clinical pharmacist in a Veterans Affairs primary care clinic. He works with patients to combat diabetes, high blood pressure and other chronic diseases. Amelia is currently a stay-at-home mom to their one year old adventure baby, Gabby, and has her sights set on the Masters program in Architectural History at UVA. She also has a hobby Etsy shop selling vintage clothing and housewares. 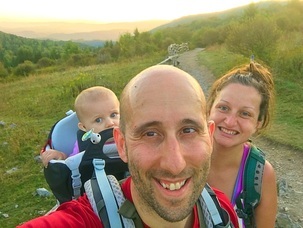 Nick, Amelia and Gabby enjoy hiking, camping, and international travel. They recently discovered the concept of cohousing and are excited about the potential of living in a community where they feel more connected and neighbors are also friends. Laura is yoga enthusiast, makes a mean pumpkin muffin, and napping is one of her best skills. Steve is uncomfortable writing about himself and wishes I would stop asking him to describe himself in one sentence. Steve and Laura both enjoy a good surprise and not too long ago, the universe got them with one of the greatest surprises of all time...twins! They've been lucky to have experienced many adventures already - from swimming with elephants in Chiang Mai, to learning to make (real) cider in Gloucester, to setting off on a road trip with nothing more than their dogs, a map and some camping gear. And now they look forward to their next adventure, raising a family. After living in big cities for the last decade, they'd like their kids to grow up in a place where they can see mountains and play in streams, a place where they know their neighbors, and a place where they have the freedom to explore. They'd like to live in a place where they are part of a community, where they can live smaller, and where they can walk to a brewery. Emerson Commons is that place! p.s. For money Laura does business stuff and Steve does research or something. They look forward to their first retirement and spending more time on things they love. Hugh graduated from the university of VA in '85 and feels like Charlottesville is home. He went on to Dental school at MCV, graduated in 1990, and has spent most of the intervening years in Fredericksburg. His office was at Locust Grove until he sold it 1 year ago. He plans to specialize in TMJ and Craniofacial Pain and sleep apnea at his new office in Charlottesville. His interests include Unitarian Universalism, drumming, woodworking, photography and yoga. The family consists of Angie and Penny, both rescue dogs, and a bird, Josh. He is the proud grandfather of 5 awesome grandsons. Jane Ellen is a native of Charlottesville, graduate of Lane High School and Mary Washington College. She has lived in Fredericksburg since 1976 and raised 5 children there. . Jane Ellen is an active Unitarian Universalist. Other interests include grandchildren, gardening, yoga, her dogs, and helping Hugh with his Dental Practice. Brian lives all things beer as the Operations Manager and Music Coordinator at Pro Re Nata Farm Brewery in Crozet. Mary is a graduate student at the University of Virginia (and would love to be a professional student when she grows up though she knows this is not a lucrative endeavor). Harrison is going to be an astronaut someday. Or a fireman. These days, he contents himself with running around outside and picking up all of the sticks. All of them. Brian and Mary both grew up in "old fashioned neighborhoods" where you knew your neighbors and kids played together outside everyday without having to set up (gasp) playdates. They look forward to Harrison having that same opportunity with his friends at Emerson Commons! Joshua is a devotee of life-long learning, intergenerational relationships, and community building. With a background in both environmental education, and the healing arts (primarily massage therapy), he brings his gifts wherever he travels. Dancing, singing, storytelling, and living an examined life are some of Joshua's other passions. Born overseas, and raised in Europe (till age 7) and then mostly in Washington, D.C., Joshua considers relationships, and clear communication above all else. He stumbles, makes mistakes, harvests lessons like a good human, and is excited to make life-long connections with folks of all ages, inspiring health, wellness, and raising the bar for what is possible for living an authentic, and inspired life. Adrienne has lived in Ivy for 21 years and considers the Ivy/Crozet area home. It is time for her to downsize and Emerson Commons is the perfect fit for meeting those practical needs, as well as for being part of a caring, interactive community. And how wonderful to be in such a lovely place nestled in nature. She retired five years ago after 33 years as an acupuncturist. Her life is a simple one now with swimming, walking, gardening, reading, and hanging out with friends. She looks forward to sitting on her front porch with E.C. friends and helping out with the gardening. She actually likes weeding! 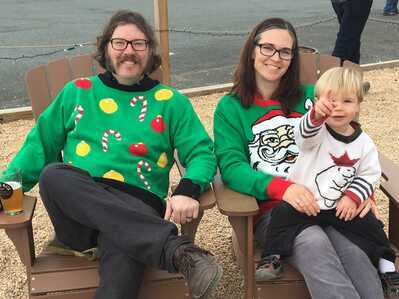 Matt and Mandy moved to Virginia to join the Emerson Commons community from Jackson, Mississippi with their baby daughter, Myriam, 4 year-old son, Starr, and half-time with Matt's 9-year-old son, Simon. Matt and Mandy met while in grad school at Vermont College of Fine Arts, and both hold MFAs in writing for children and young adults. Matt is the author of two picture book biographies for middle grade readers (Small Wonders and Lighter Than Air) and works remotely as a mapmaker for a small GIS firm in Jackson. He is also an avid birder and naturalist, and runs a natural history blog and field guide at The Pigeon. Mandy has dreamed of living in cohousing for many years and looks forward to networking, going to cohousing conferences and becoming an active member of the national movement. She is currently at home raising Starr and getting acquainted with the Charlottesville/Albemarle County area. She loves to learn and share about natural wellness, yoga, art, writing and has all kinds of dreams of where those interests may lead in the future. ​Kat is returning home to Virginia and coming to Emerson Commons after being in Boston (+ Rwanda) for the past 13 years. The mountains are invigorating and soothing to her and she looks forward to walking barefoot without worry of broken glass on the sidewalk. One of Kat's main passions is dancing, not that she's especially talented in any particular form, but music and movement reach inside, and she seeks dancing opportunities and communities wherever she goes. In the professional realm she has been doing research as an atmospheric scientist, building/deploying instrument systems to measure greenhouse gases and the like. This is what took her to Rwanda for several years, and now she is proudly watching and supporting her Rwandan colleagues run their observatory station with ease and insight. The Blue Ridge Mountains have an uncanny resemblance to the rolling mountains of Rwanda. In coming across Emerson Commons and the community there, she had an immediate knowing that this was where she wants to go. Kat also teaches self-defense on the side, so be nice or she'll poke you in the eye. Rose and John recently returned from a medical service trip to the Humla district of Nepal, high in the Himalayas near the border with Tibet. They trekked for two weeks, helping bring traditional medicine clinics to four remote ethnic Tibetan Bonpo villages, camping along the way. They would love to tell you about it and show you pictures (www.HumlaFund.org). Rose and John have 15 grandchildren between them, but many are far away, so they look forward to having “local grandchildren” in the Emerson community. Rose is an attorney at the Securities and Exchange Commission, a CPA, yoga teacher, infant massage teacher, quilter, aspiring clawhammer banjo player, enthusiastic composter and organic gardener, licensed massage therapist (as of July 2017), and former math teacher. John started his medical career working with Native Americans in Arizona as a Public Health Service officer. He has been an integrative (holistic) physician since 1978, and brings acupuncture, osteopathy, homeopathy, nutritional, and mind/body techniques to his family physician practice. He has specialized in helping people with chronic pain and chronic illness restore their health. His interest in spirituality and health led him to a Master of Divinity at Harvard Divinity School in 2011 and, most recently, to the experiential study of shamanistic practices. 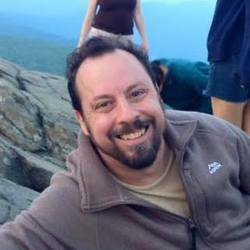 He expects to continue practicing in the Charlottesville area, and hopes to join a local choral group and to hike more along the Blue Ridge. Rose and John think that cohousing is the only sensible way to live, and they are very excited about joining this community. Colin and Meagan are excited to be joining Emerson Commons. They've been in Charlottesville for a few years, having absconded from Washington D.C. for greener pastures. The area felt like home - even more so after they welcomed their daughter to the family last year. They bring with them a Bernese Mountain Dog named Hans, an indoor/outdoor cat named Stella, and a love of 80s music. They also enjoy hiking and being outdoors. Colin will be your neighborhood pizza aficionado (afficianado means eats all the pizza right? ), likes getting his hands dirty, and should probably try to get into better shape if he's going to eat all this pizza. Meagan has recently gotten interested in baking and is looking forward to having lots of neighborhood mouths to feed. When they aren't lavishing attention on their daughter and furry family members, Colin works in a job straight out of the movie Office Space, and Meagan is a registered dietitian at UVA Medical Center. Carol, Orlando, Jericho, Daniel, and Ociel are excited to finally live in a co-housing community. The family loves travel, theater, comedy, making YouTube videos, and finding treasures at yard sales. ​Orlando grew up in Mexico City and the Sonoran Desert and traveled all over the US and Canada. Carol was a high school exchange student living in a castle in France, studied Spanish in Spain and Peace Studies in Jerusalem, and found her long lost family in Sicily, Italy. Orlando and Carol both volunteered in the rural small villages of the Sierra mountains in Mexico through the American Friends Service Committee. They both now work with troubled youth. Jericho has started stand up comedy and hopes to take to the road making a living by making others laugh. Daniel loves computers, WII, reading, and taking care of his dog, Bailey. Ociel loves basketball, riding his bike, and swimming. Jessica and Michael sometimes like to joke that they have lived in the “Thomas Jefferson triangle”-- going to school at William & Mary, moving up to DC for a couple of years, and then settling down in Charlottesville where it is much less swampy and you can see mountains. They also both enjoy writing and a decent library, although that’s about where their similarities with TJ end. Jessica works at an environmental non-profit in downtown Charlottesville on sustainable packaging and recycling, and in her free time enjoys petting dogs and knitting into the wee hours of the night. For professional things, Michael is involved in a variety of activities that include but are not limited to: writing tutoring, swim coaching, child wrangling at Boys & Girls Club, and working with local communities on affordable housing. He can also be found hosting podcasts on science fiction and fantasy, practicing the guitar and marimba, and making delicious pasta. Michael and Jessica also both enjoy hikes and outdoor adventures with their dog Moe, even though Jessica is afraid of spiders and Moe is afraid of trees. While in college, Jessica spent a semester living abroad in an ecovillage in Iceland, where she learned about different kinds of intentional communities and how powerful it could be to have a group of people who actively wanted to be involved in the shape and life of their community. She fell in love with that way of life, and ever since has been looking for a way to be a part of a similar community here in the US. Michael grew up in a close-knit neighborhood, and spent his summers at the community pool with friends and family. Since living in a series of relatively impersonal apartment complexes, he’s excited to find that spirit of community and fun once more. Samantha is grateful to have grown up in the close-knit community of Lovingston in Nelson County, where she and her friends enjoyed the run of the village as well as the surrounding fields, hills and mountains. As a child, she played musical instruments and, after earning an undergraduate degree in music, was able to merge her love of music and history in graduate studies in musicology. Most of her adult life was spent in the Washington, DC area, where, among other things, she worked at the Copyright Office at the Library of Congress for 24 years, raised a step-daughter and daughter, and discovered a passion for gardening. In her fifties, she took up a new instrument (the modern lyre), pursued a Ph.D. in musicology, became an IT professional, and undertook alternative music therapy trainings. In 2008, she moved back to Nelson, and these days she’s active with music, writing, and gardening (with a special interest in native plants and organic vegetables and fruit). Her daughter and grandson live in Herndon. Now, she’s looking forward to being part of the community at Emerson Commons. Molly and Peter Lazar first heard of cohousing in a UU World article in 2004. They were immediately drawn to the idea of living in a functional neighborhood where you know your neighbors. Within a year, they moved to Shadowlake Village Cohousing in Blacksburg, Virginia with their then 1 and 3-year-old daughters. They have immensely benefited from and enjoyed their 13 years in cohousing. ​Their daughters, who are now in highschool, are so passionate about growing up in community that they created a video about cohousing that premiered at the 2015 National Cohousing conference. Living in community has provided the Lazar family with both privacy and spontaneous social opportunities. Last winter, some Shadowlake members randomly invited neighbors to build an igloo. Check out the video — you may be surprised by how many cohousers fit inside!